A Flight Design CTsw flown by Indian Air Force officers Rahul Monga and Anil Kumar completed a round-the-world flight in 79 days, believed to be a new world record for this class of aircraft. The flight was done as part of celebration of the Indian Air Force 75th Anniversary. Monga and Kumar began their voyage on June 1st at Delhi, India and returned August 19th. Even before the Indian Air Force Round the World flight, the Flight Design CT has gathered significant experience from intercontinental flights: Berlin, Germany to Toronto, Canada, and Toulouse, France to Kongo, Africa. Intercontinental flights under extreme climate conditions give the Flight Design Team an approval of their concepts and additional knowledge for future development. The CTsw has an empty weight of 698 lbs., and a maximum take-off weight of 1320 lbs., resulting in a useful load of 622 lbs. Slice 250 off that for standard oil and fuel, and you can occupy the two seats with 372 lbs. of humans. That's 186 lbs. per chair, and by the looks of the two Indian pilots, neither topped the scale north of 150 lbs. That would theoretically leave 72 lbs. (about 11 gallons) available for additional fuel. At a maximum fuel economy power setting, those eleven gallons could push the CTsw an additional 396 nm...for a grand total of 1,396 nm per fuel load...if they had a tiny 11 gallon aux. tank in the trunk. They covered 25,310 miles in 79 days, which means they had to stop for gas just 18 times. Of course, this is all gibberish, and the aerospace engineers in the audience will quickly point out that without knowing the exact weight of the pilots, or the exact quantity of any onboard aux. fuel tanks, there is no way to precisely calculate the effective range of an CTsw in this type of flight. I just wanted to throw some numbers around and see what happened. But these results – far from inconclusive, I grant you – bodes well for the LSAs, I believe. If anyone thought the only use for a Light Sport plane was to chase down hamburgers costing $79.32 – a discount off the usual $100 rate – this world flight proves LSAs are the real deal, capable of actually taking you somewhere. Just as long as that somewhere can be reached at an altitude less than 10,000 msl, on a daytime flight when visibility is at least 3 statute miles, at a maximum airspeed of 120 knots, with only one passenger along to enjoy the ride. 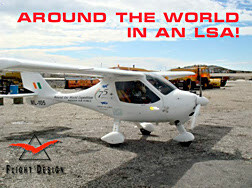 If that sort of flying floats your boat, maybe an LSA is your ticket to the sky.